Web design­er and search engine opti­miza­tion spe­cial­ist Bas­ti­aan Berende serves small busi­ness web­site design and SEO clients in the Wis­con­sin Dells, Bara­boo, and Madi­son area. Native of the Nether­lands he has lived in the Unit­ed States for 16 years and pledged alle­giance to the Unit­ed States five years ago. He came to the US enrolled in a spir­i­tu­al pro­gram based on A Course in Mir­a­cles. As part of this pro­gram he ren­dered his ser­vices to the Web Office of the New Chris­t­ian Church. Here he was trained as a graph­ic and web design­er by John Old­ham and his Web Office team. Bas­ti­aan learned about graph­ic design prin­ci­ples, col­or the­o­ry, archi­tec­ture, orga­ni­za­tion, and lay-out trends. He also learned how to work with art, graph­ics, and pho­tos, about typog­ra­phy, and cod­ing lan­guages such as HTML, CSS, and PHP. He was taught how to use graph­ic, pub­lish­er, and web design­er pro­grams such as Col­or Wheel Pro, Adobe Acrobat,Dreamweaver, In Design, Illus­tra­tor, and Pho­to­shop. He also learned to work with con­tent man­age­ment sys­tems such as Joom­la and Word­Press and built and main­tained sev­er­al blogs and web­sites. He fur­ther prac­ticed and inte­grat­ed his skills when in a peri­od of eight years he cre­at­ed and ran a suc­cess­ful spir­i­tu­al edu­ca­tion pro­gram. He start­ed with a week­ly class on loca­tion and devel­oped it into an inter­na­tion­al online and offline out­reach pro­gram. The cur­ricu­lum and its mate­ri­als were made avail­able in Eng­lish, Span­ish, Dutch, French, and Pol­ish. The goal of the pro­gram was to help stu­dents to have a true expe­ri­ence of A Course in Mir­a­cles, by teach­ing it. He also sup­port­ed the Church with graph­ic design, web­site design, and con­tent cre­ation for sev­er­al con­fer­ences, projects, blogs, web­sites, and online cours­es. As soon as he left the church he start­ed work­ing as a web design­er for Kira Brooks Design. Dur­ing these three years he learned about work­ing with small busi­ness clients and wit­ness­ing to her suc­cess inspired him to start his own busi­ness. Bright Clear Design was offi­cial­ly found­ed in March 2012. Bas­ti­aan start­ed his busi­ness by ded­i­cat­ing the time between his ear­ly morn­ing and late after­noon rides as a school-bus dri­ver. To launch and grow his busi­ness he became a mem­ber of BNI “Net­work­ing for Suc­cess” in Reeds­burg. Here he received refer­rals for his first small busi­ness clients. Then in 2014 he joined anoth­er busi­ness net­work­ing group in Bara­boo. Next to giv­ing and gain­ing busi­ness refer­rals with­in those groups, he mas­tered pre­sen­ta­tion and social skills, learned about best busi­ness prac­tices, and found sup­port to move for­ward in his busi­ness. Bas­ti­aan rec­og­nized the impor­tance of a great look­ing logo for a website’s pro­fes­sion­al appeal and visu­al design. For busi­ness­es with­out or with an out­dat­ed logo he offers cus­tom logo design as a com­ple­men­tary ser­vice. In the begin­ning the catch­phrase was Bright Clear Design “For Good Look­ing and Well Work­ing Web­sites”. But through cor­re­spon­dence with his clients Bas­ti­aan soon dis­cov­ered that next to hav­ing a good look­ing and well per­form­ing web­site, it is of equal or even more impor­tance to be find­able on the inter­net. What is the use of a great web­site when no one, oth­er than who already has your web­site address, can find you. Bas­ti­aan went back to the draw­ing board and stud­ied and prac­ticed Search Engine Opti­miza­tion. He now offers sev­er­al SEO pack­ages and opti­miza­tion for local vis­i­bil­i­ty. Then because of a bet­ter user expe­ri­ence and advan­tages for search engine opti­miza­tion he switched from Joom­la to Word­Press as his web­site soft­ware. For more about the advan­tages of Word­Press Web­site Design vis­it our web­site design page. My busi­ness catch phrase there­fore became: Bright Clear Design for afford­able, easy to use, and future proof web­sites, find­able for search­es on the inter­net. Click the fol­low­ing links to learn more about inex­pen­sive web­site design, easy to use web­site design, and future­proof CMS web­sites. An addi­tion­al skill Bas­ti­aan devel­oped is con­tent writ­ing. He spots spelling and gram­mat­i­cal mis­takes in a glance, and strength­ens sen­tences with minor tweaks. Some clients would keep him wait­ing for months before send­ing him their text con­tents. Not every­one has the time or ambi­tion to do their own writ­ing. As a result of his clients’ writ­ers block and the new­ly acknowl­edged king­ly sta­tus of con­tent on the inter­net, he invent­ed a smart process for pro­duc­ing con­tent. With­out dupli­cat­ing or rehash­ing con­tents from oth­er sources he found a way to pro­duce per­son­able infor­ma­tion direct­ly draw­ing from clients’ knowl­edge and expe­ri­ence. 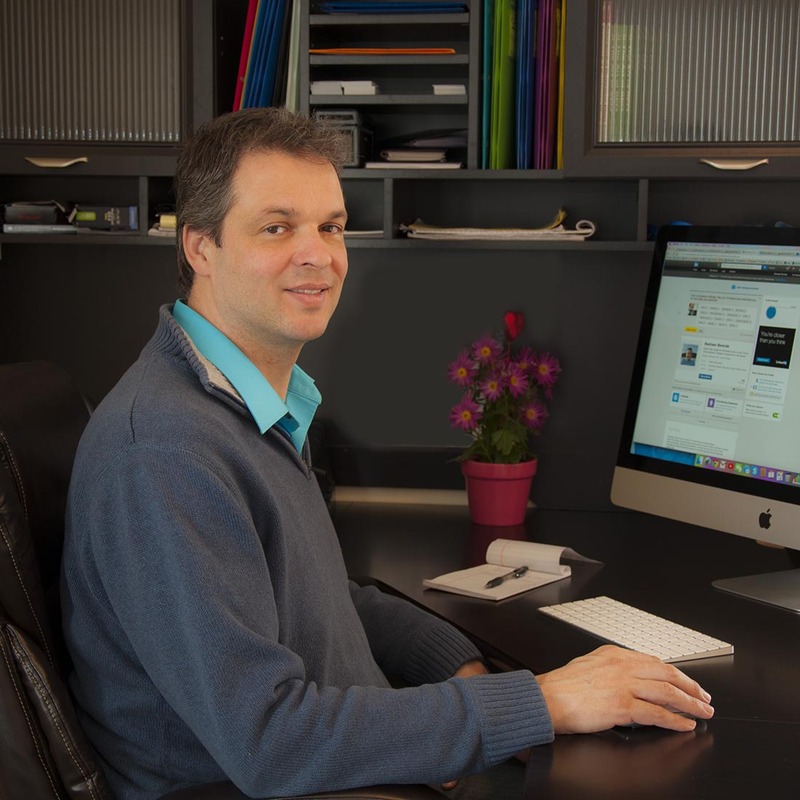 Con­tent writ­ing now com­ple­ments both his web­site design and SEO ser­vices. To hone all his pro­fes­sion­al web design­er, and search engine opti­miza­tion skills he con­tin­u­al­ly reads books, stud­ies arti­cles, and takes web design­er online uni­ver­si­ty cours­es on lynda.com. Bastiaan’s wife Cecile as you can read more about under “about the pho­tog­ra­ph­er” tab pro­vides the com­ple­men­tary ser­vices of pho­tog­ra­phy and video clip pro­duc­tion. There­fore, Bright Clear Design cov­ers the essen­tial range of online mar­ket­ing ser­vices to small busi­ness, inde­pen­dent pro­fes­sion­als and non-prof­it orga­ni­za­tions. View our web design port­fo­lio or read tes­ti­mo­ni­als from sat­is­fied clients to gain more con­fi­dence about work­ing with us. Or sim­ply get start­ed on your way towards a pub­lished and find­able web­site. Next to his design work, Bas­ti­aan is active in per­son­al heal­ing and growth work. He med­i­tates, like to bicy­cle, swim, and take long walks with his love­ly wife. He is hap­pi­ly mar­ried to a beau­ti­ful french woman Cecile, and through his mar­riage he became step dad to a won­der­ful­ly bright and cre­ative eleven year old girl Kimia. Bas­ti­aan does men’s growth work and a cou­ple of times a year vis­its pris­ons as part of the Truth Project. My name is Cecile Bouti­er and this is how pho­tog­ra­phy has worked through my life. My moth­er was the first per­son who brought the idea that a 3D object can be per­ceived, observed, absorbed and repro­duced onto a piece of paper. She would draw por­traits of me or my broth­er. Fruits she would leave on our din­ing room table for dec­o­ra­tion. Wild flow­ers she would col­lect from the for­est. The vase and balls she would use and paint to hold the fruits and flower. I remem­ber being fas­ci­nat­ed and at the age of four try­ing to do what my moth­er was able to do with her adult mind and skills. I felt so frus­trat­ed I was not able to achieve it as well as she did. My father’s sis­ter also an artist went to the same art school in Paris as my moth­er and became so tal­ent­ed in tak­ing pho­tographs. Cap­tur­ing details or sit­u­a­tions and emo­tion that no else could see. She was able to catch my atten­tion at the ear­ly age when I saw in the frames attached to her walls how she would play with light and shad­ow, shapes and tex­tures. In see­ing her art in her apart­ment in Ver­sailles inspired me to look at life and objects in a way that today I can only feel grat­i­tude for. I was prob­a­bly 6 years old when a rela­tion­ship and a deep pas­sion that I felt for pho­tog­ra­phy came alive in me. A seed was plant­ed in my mind and caught my atten­tion to what I believe showed me a dif­fer­ent dimen­sion about myself. The first time I ever saw myself and what I looked like was when a nun at school showed me a pic­ture of me. She said, “do you know who this beau­ti­ful lit­tle girl is?” I looked at the pho­to­graph she hand­ed to me and while I was star­ing at the lit­tle girl I remem­ber vivid­ly think­ing, wow this lit­tle girl is very beau­ti­ful. I stopped and searched in my mind to see if I knew her from some­where. But noth­ing came to me. I told the nun, no I do not know who this lit­tle girl is and she smiled and she said this lit­tle girl is you. I looked at the pic­ture again and I could not believe it. I thought she was teas­ing me and play­ing a game with me. But no she was seri­ous. I fell in love with the pho­to­graph and I said thank you to it for see­ing me so beau­ti­ful. From this moment I not only dis­cov­ered some­thing I did not know before but was also mes­merised by the idea I had an image that not only oth­ers could see but that I could see as well. I realised every­one could see an image of him or her­self, which intrigued me at the time. At the age of 14 years old I was intro­duced to the lab we had in my school and I was giv­en a cam­era to exper­i­ment with. I loved spend­ing time in the lab, tak­ing the film out of the box in a dark space and see­ing images I took com­ing alive on white glossy paper. The light, the wait, the set up, the chem­i­cals, the mys­tery, and the art to me was like a con­cert con­clud­ing at the end of its long per­for­mance to let us know the sto­ry was over. Most of the pic­tures I took at the time were at the sta­ble when my friend and I were rid­ing and learn­ing all about hors­es cam­era and pho­to lab. I learned all about the cam­era, how to use it, and how to cap­ture what I real­ly love or what oth­ers love. Then lat­er in life as I took the option of French cin­e­ma at uni­ver­si­ty, I went to Lyon Lumiere in France and I learned all the hard and bor­ing but nec­es­sary tools about a cam­era and pho­tog­ra­phy. Lyon Lumiere spe­cialis­es in pho­tog­ra­phy and lan­guages, the two sub­jects I was fas­ci­nat­ed with. I dropped the world around pho­tog­ra­phy until my daugh­ter was born. Then I decid­ed to be a pho­tog­ra­ph­er and to prac­tice with baby pic­tures and chil­dren, fam­i­lies, ani­mals, and land­scapes. I trav­eled all over and cap­tured all that I saw and thought mag­nif­i­cent to my eyes so I could share it with you.